Lt. Gen. Arnold Bunch Jr., the military deputy for the Office of the Assistant Secretary of the Air Force, center, testifies before the Senate Armed Services Subcommittee on Tactical Air and Land Forces, and Air Force Modernization, March 29, 2017, in Washington, D.C. Also testifying were, right, Lt. Gen. Jerry Harris Jr., the Air Force deputy chief of staff for Strategic Plans, Programs and Requirements, and Lt. Gen. Mark Nowland, the Air Force deputy chief of staff for Operations. 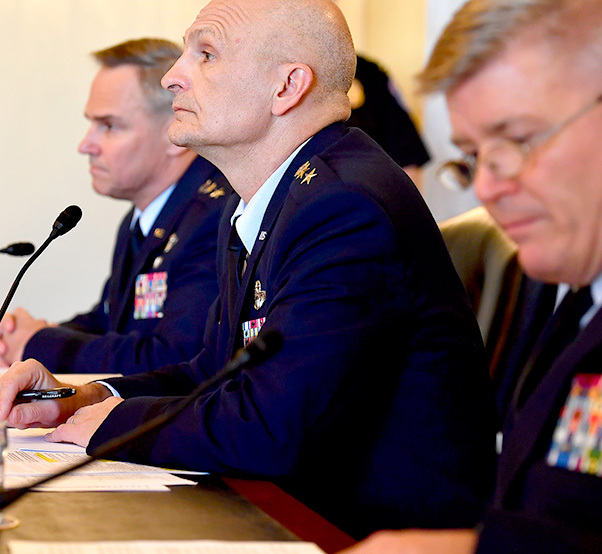 Air Force senior leaders testified about Air Force modernization before the Senate Armed Services Committee in Washington, D.C., March 22, 2017. Lt. Gen. Chris Nowland, the deputy chief of staff for Air Force Operations; Lt. Gen. Arnold Bunch, the military deputy for the Office of the Assistant Secretary of the Air Force for Acquisition; and Lt. Gen. Jerry Harris, the deputy chief of staff for Air Force Strategic Plans, Programs and Requirements shared Air Force needs before the Tactical Air and Land Forces subcommittee. “(Modernization) is critical to our operators, to give our Airmen the best chance of success,” Nowland said. The Air Force emphasized the need for a defense appropriation over a year-long continuing resolution, citing the devastating impact a year-long continuing resolution would have on both readiness and modernization efforts. Senior leaders also requested permanent relief from the Budget Control Act, increased funding, flexible execution authority and manpower to recover full-spectrum readiness. In 2013, sequestration forced the total force to make sacrifices in readiness and size to ensure technological superiority. “The best thing we can get out of Congress is a stable budget that predicts — allows us to have a good prediction of where we’ll be in the future,” Harris said. Sustainable funding across multiple fiscal year defense plans is critical to ensure the Air Force can meet today’s demand for capability and capacity without sacrificing modernization for tomorrow’s multi-domain high-end fight against a full array of potential adversaries, the generals said. There is a disparity between commitments and the resources necessary to achieve national security objectives, according to the generals. The first step to regain full-spectrum readiness is to rebuild the operational training infrastructure. This includes virtual and constructive environments as well as ranges and space necessary to train against high-end threat systems in a multi-domain environment. Once established, fourth and fifth generation fighter units will need to train for emerging threats. The Air Force currently has 55 combat fighter squadrons and wants to grow to 60 and increase the total number of aircraft from 1,900 to 2,100. Linking all of the systems needed for tomorrow’s fight and accomplishing training requires both manpower and funding. 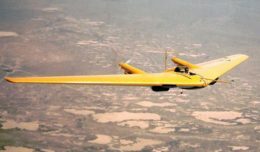 The Air Force requested an increased end strength to meet national security requirements. The Air Force is developing plans to address shortfalls in a number of key areas, including critical career fields such as aircraft maintenance, pilots, nuclear command, control and communications, intelligence, cyber and battlefield Airmen. The Air Force is short approximately 3,400 aircraft maintainers and 1,555 pilots across the total force. Congress increased the Air Force end strength to 321,000 in 2017. However, the Air Force senior leaders project that 350,000 is needed to have a total force that doesn’t have to be stretched to meet the national security requirements. The generals highlighted that a year-long continuing resolution would force end-strength growth to halt at 319,000, further stressing the existing manpower challenge. “We can execute the (national defense) strategy, but to be perfectly honest, it will be great Airmen that will make it happen and we’ll do it on the back of our Airmen,” said Nowland.